The premiere edition of the 2017 DearGuest Awards held at “Dusit Thani Lake View Hotel”, located in the fifth settlement of the New Cairo District witnessed an enthralling showcase of entertainment. Hosted by the gorgeous “Poussy Shalaby”, the event unfolded with great flair. The film fraternity which turned out to support the leading celebrities applauded their sense of humor all throughout the night, cracking up at their jokes, gimmicks and enjoying their night together. The star-studded event, celebrated and recognized the grace, style and glamour of the most timeless beauties. audiences to fresh new faces and original and distinctive filmmaking. Glamour stakes were high at the 14th edition of the DG Film Festival’s night, it was all about distinction — commending the year’s most eminent and flourishing achievements. Actors, directors, producers, writers and the best of the industry all anticipate Egypt’s finest Award winning night showcased at one of Egypt’s premiere locations. The red carpet was tremendously ablaze with the crème de la crème of the industry adorned in their finest and much, much more. The night shone with electrifying star performances. DG honored and awarded living legend Laila Elwy for her success story with a lifetime achievement award as her name continues to be recognized with eminence among renowned prodigies. The notable work of all the great award winners mentioned below deservedly placed each and every one in the lead winning them all a DG Special award. Dear Guest Special Awards were presented for the credible work of Ahmed Zaher for his role in “Ekhtiar Egbary & Al Tofan series”. The gorgeous Abeer Sabri was awarded for her role in “Al Tofan Series”. 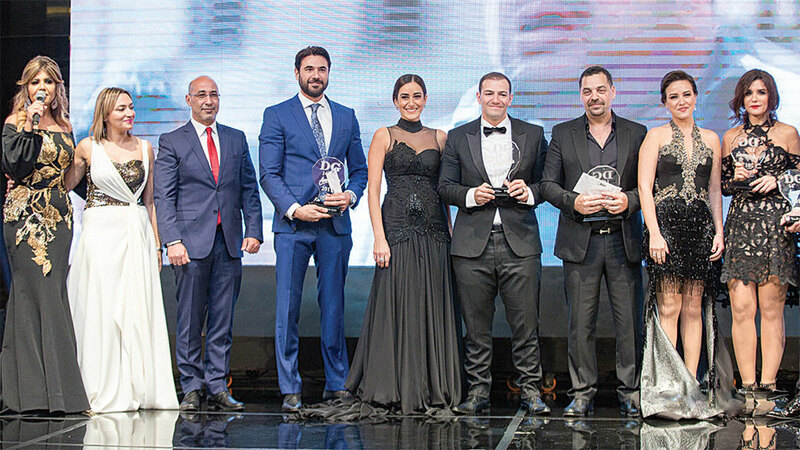 The infamous Khaled El Nabawi was awarded for his role in “Wahet El Ghoroub series” The talented Tarek Lotfi for his role in “Ben Alamin series” and favorable Youssef El Sherif for his role in “Kafr Delhab Series”. The forever focused Yasser Galal was awarded for his role in “Zel El Raees series”, beautiful Dalia El Behiery for her role in “Yawmeyat Zoga Mafrousa”, and the ever convincing Wafaa Amer for her role in “Al Tofan series”. Hanan Metawea was very deservedly awarded for her role in “Haza El Masaa Series”, Lekaa El Khamisi for her role in “Ben 3alamin series”. And the flawless Dhaffer L’Abidine for his role in “Halawt El Donia series”. Ahmed Falawkes for his role in “El Ab El Rohi Series”, Diab for his role in “Kalabsh & El Ab El Rohi Series”. Everyone’s favorite Sherif Mounir for his role in “Al Zeabak series”, incredible Fathi Abdel Wahab for his role in “Horob Eterari movie”, Riham Abdel Ghaffour for her role in “La Totfea Al Shams series”, and Sabrin for her role in “El Gama3a series”. The stunning Dina was awarded for her role in “El Herbaya series”. The talented Sherihan Abo El Hassan for “Set El Hosn Program”, and funny man Edward for his performance in “Al Kahera Al Youm”. Walid Mansour for his role in Arabian Cinema Awards Success & Cinema production in 2017. The innovative Walid El Hariri was awarded for his role in the Events Light Designs during 2017. The best male radio announcer award went to Mohamed Nashaat and beautiful Shaimaa Hafez won the same award for the female category. Another big winner yet again, was the distinguished sports presenter Ahmed Shobier, who won the award for 2017. Dear Guest Voting Awards for television were presented to the stunning Nelly Karim who took home a plaque with the title of Best Actress. While the talented Amir Karara won the exact title in the male category for 2017. The best series award went to “Le A3la Se3r”. This year’s Best Youth Actor/ Actress awards went to the worthy pair Ahmed Magdy and Amina Khalil. Amr Adib and Mona El Shazly received awards for their substantial magnitude within the media throughout 2017.
award once again went to the impressive leading lady, Ghada Adel. DG Best Youth Award was presented to Mohamed Mamdouh, and Mai Omar took home her award in the exact female category. Al Khaleia, was voted “Best Film” of the year. The Best Cinema Director and script awards went to the very talented and worthy Tarek El Erian and Salah El Geheni respectively. The DG Award for Best Oriental Singer went to Mahmoud El Leithy, who set the stage on fire with his performance. Dear Guest Best Comedian Actor Award in Television went to the very deservingly none other, but Samir Ghanem. Stunning Yasmine Abdel Aziz won the exact title in the female category. The Best Comedian Actor award in the Cinema category went to everyone’s favorite Mohamed Henedi. Osama Al Hendi’s outstanding talent earned him an award for best music arranger, while pioneering Amir Teama won his award for best poet, along with Khaled Ezz, winner of the best composer award. The powerful voice of the absolutely gorgeous Asala deservedly won her the Best female singer for 2017, and her song with Mahmoud El Esseily “Shar wa Kheir” was awarded best Movie Song of the year, while the esteemed forever young Amr Diab was named best singer as well as his “Ma3ady El Nas” winning Best Album for the year. DG Best Rising Singer award went to Mina Attallah, and promising Ibtissam Tiskat won her award in the exact same category for the female division. Amr Adib and Lamees El Hadidy received awards for their substantial magnitude within the media throughout 2017. Television greats Mohamed El Adl was awarded the Best Director award, while Tamer Habib was presented the Best Script writer award and was also awarded best Clip award for “3 Dakat” which he performed on stage and had the audiences go wild. Best Art Director award went to Basel Hossam, Best Cinematography award went to Haitham Hosny and the DG award for best costume Design went to the increasingly talented Engy Alaa. It was an inspirational night of jaw dropping beauty and sensational couture where all the guests wrapped up the evening with a new appreciation of one another’s achievements. DG also awarded a number of News, TV channels, programs and websites according to the survey results. EgyGo Co. for its role in handling DearGuest website & Social Media. Harmony Press for its role in DG magazine printing quality.